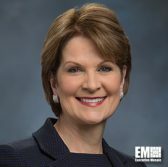 Lockheed Martin CEO Marillyn Hewson has said partnerships that focus on growth and shared opportunities play a key role in global security. “Public-private partnerships are most effective and most transformative when they are focused on making a strong, long-term impact,” Hewson, a 2018 Wash100 recipient, said Monday at the Global Aerospace Summit in Abu Dhabi, United Arab Emirates. She also cited the insights the company learned from those partnerships in the UAE and other countries and how those help drive competitiveness, innovation and economic growth. Lockheed has teamed up with Mubadala Investment Co. to support the Unmanned Aerial Systems Payload Design Challenge that aims to encourage university students in the Middle Eastern country to develop and incorporate payloads with industrial and commercial uses into aerial drones.